A short time ago we introduced you to Silke. Silke, who is from Germany, received her VIBRANT SOUNDBRIDGE Middle Ear Implant at the end of November 2016. 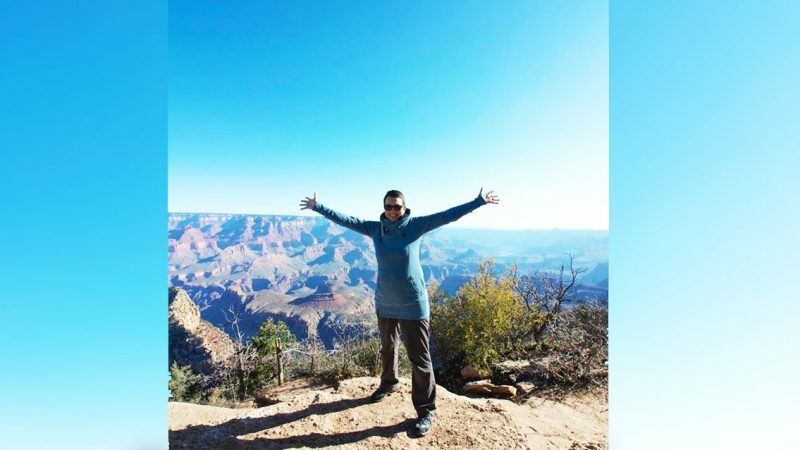 Silke went on a roadtrip in the USA earlier this year, enjoying improved hearing for the first time in 20 years. Here, she shares what is was like to go on holiday with a hearing implant and all the unforgettable hearing moments she had. We went on a “road trip” down the West Coast of USA, starting in San Francisco, with a short detour to Yosemite National Park. We went whale watching in Monterey and visited lots of national parks and places like Santa Barbara, Palm Springs, Las Vegas and the Grand Canyon. The first look at the Grand Canyon left me speechless. There were a few stand-out hearing moments on my trip. One was the moment I heard the distinctive sound of a “blow out” from a whale for the first time ever. A second later, I saw a hunchback whale lunge feeding. This will forever stay with me and is one of the most impressive wildlife encounters in or on the ocean in my life so far, even though I had some pretty awesome encounters already as a scuba-diver. Another amazing moment was the realization that waterfalls can indeed be deafeningly loud. They do not whisper, but roar! The most challenging thing throughout the whole trip was flying. Sometimes the announcements on the flight were interfering with the SOUNDBRIDGE, so to be honest I just turned it off. One of my favorite holiday memories with regards to my improved hearing was actually that of total silence. This might sound strange I know. We had stopped in the middle of nowhere on Route 66 and got out of the car. We had seen no cars, nor any other sign of life for the last hour—the complete and utter stillness really got to me. My husband asked me, “Can you hear this?” At first I thought “No, I can’t—how frustrating…what does he want me to hear?” He went on to say, “There is no sound at all honey, no traffic, no birds, not even a cricket—this is what silence sounds like. Isn’t this beautiful?” That’s when I realized that it wasn’t silent because I just couldn’t hear the sounds, but because there simply weren’t any sounds! To be able to appreciate absolute silence was a stunning experience. Without the SOUNDBRIDGE I would neither have been able to experience nor appreciate this at all. Astonishingly, I didn’t come across anyone who asked about my hearing implant. This was very different to my first weeks back at work when I had to field quite a few—sometimes strange—questions. Nevertheless, I always tried to answer as detailed and technically correct as possible—at least when they seemed sincere. To be honest I was positively surprised at how natural it seemed to most of the people we met in America, but I guess that’s because these devices are more widely known and used there. One encounter left me grateful and inspired, as the young man in question showed so much empathy. We were having breakfast at our Lodge near Yosemite, when I realized that the young man in charge of our table must have seen the SAMBA and obviously understood exactly what it represented, without having to ask. But instead of speaking louder or even slower—which sometimes happens when people realize I wear some kind of hearing device and which I find rather irritating—he just made eye contact with me, ensuring that he had my full attention before he started talking. But he did this in such a gentle and unobtrusive way, that it did not feel uncomfortable, but rather made me smile! I would normally just remove the SAMBA before I went to sleep, open the battery part and put it on my bedside table to have it available immediately after waking up. During the whale watching trip I made sure to wear a woolen cap, not only because it was cold, but also to make sure the SAMBA stayed dry. I bought a Baseball Cap to wear in case it rained heavily, which fortunately it did not. For other new recipients planning on holidaying with their implant, make sure you take enough spare batteries with you, because it might be difficult to find them, depending on where you go. Don’t be afraid of the security control at the airport—I did not experience any problems or questions at all. Nevertheless, you should have your implant pass at hand wherever you go. Other than that I can only say: enjoy everything you do—and hear! Read more about Silke’s journey—she searched for a hearing loss solution for the past twenty years before finding the VIBRANT SOUNDBRIDGE.